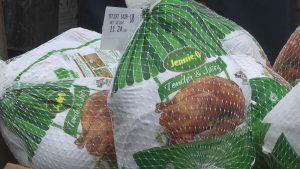 MEDFORD, Ore. — Thanksgiving is less than 2 weeks away and thanks to the Salvation Army’s annual Turkey Giveaway, many families in-need will have turkeys again this year. Hundreds lined up at the Salvation Army’s thrift store location in Medford last year where they gave out a total of 400 turkeys. This year, they’re hoping to do the same. It’s why they’re requesting 250 turkeys right now to reach that goal. The turkeys are needed by November 19th at the latest; they’re taking donations at the Salvation Army’s location on Central ave. in Medford.